Adenium Prem Sup Yellow (or Yellow Prem Sup) is a Thai Adenium hybrid that has been around for some time. This is an Adenium hybrid that I feel every Adenium lover should have. They are tough, floriferous, have amazing colours and always blooms in a cluster of three or more flowers. 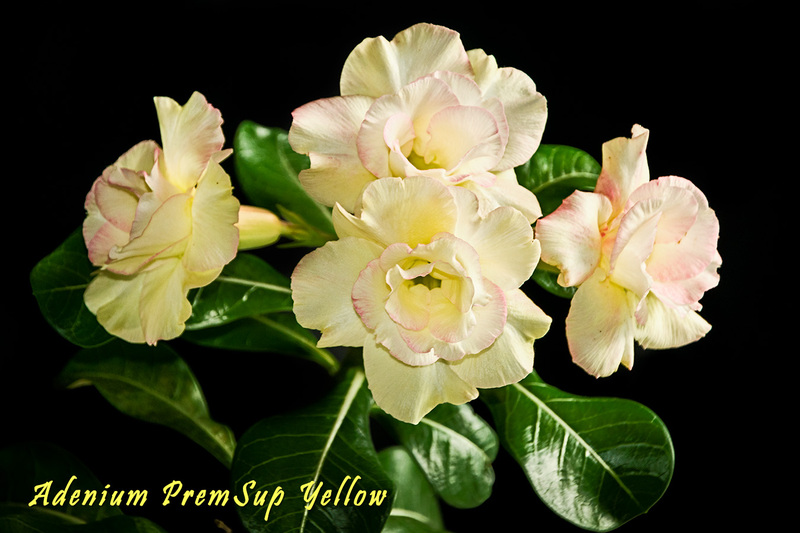 Lovely Adenium Prem Sup Yellow. The blooms start off as a light canary yellow, which quickly takes on a blush pink edging in the tropical heat. Over the days that it blooms, the flowers acquires more blush pink tones until the flower is somewhat pinkish with yellow undertones at the end of bloom lifespan. So you can get two colours in one with this Adenium hybrid. Contrasting well with flowers are the glossy, green leaves with prominent white veins. They are easily available in South-East Asian region as Thailand mass produces them for export. However one should be vary of Thailand's mass produced Adeniums as plant sanitary practices are not so well practiced, thus some plants may be virus infected.